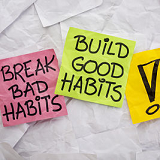 It’s pretty difficult to quit bad habits, especially those that you have practiced for years and years. However, once a habit is keeping you from achieving your goals, it must go. Write down all your bad habits. It may help to identify the habits that are keeping you from achieving your goals. Identify what triggers your bad habits. For each bad habit you have written down, identify who/what/where/when triggers it. Clean your house of all your triggers. For example, if you want to stop drinking alcohol, remove every single bottle you have in your house. If you want to eat healthily, throw out all your junk food. Come up with a better habit you can swap your bad habit with. Identify what aspect of the bad habit attracts you to it. For example, if you love eating junk food while watching TV, you may just enjoy crunching on something while watching your favorite program. Swap your junk food with carrot and celery sticks—you’ll be just as happy, and you’ll be able to rid yourself of a bad habit! Quit your habit at a pace that is comfortable for you. Some people can quit cold turkey, which is great! But others need to ease into a change. If you’re like this, start small—if you’re trying to quit coffee, switch to 50% caffeinated for a week, then decaffeinated for another, etc.